48 x 48 x 6.
various electrical components, batteries, transformers, latex, polypropylene, rubber, plastic, metal rods, speaker, microphone, servo motor, reversible DC motor, sensors. Including works by: Kent Anderson Butler, Casey Hanrahan, Kristine Marx, Yucef Merhi, Mark Pauline, Erwin Redl, and James Rouvelle. POST is pleased to present e-motion, a group exhibition curated by Susan Joyce featuring new media; motion based works by Kent Anderson Butler, Casey Hanrahan, Kristine Marx, Yucef Merhi, Mark Pauline, Erwin Redl, and James Rouvelle. Since the invention of motion pictures a century ago, artists have been experimenting in innovative ways, exploring the possibilities of art and technology. Electronic culture has expanded the world of visual art. The works in this exhibition represent the use of technology in creative and meaningful applications. In concert with artistic expression, these artists employ diverse disciplines such as light, sound, video, performance, language, and engineering. Ideas are transformed into visceral experiences, all in some way engage in the activity of motion, and in some instances interaction between the works occur. We are just beginning to scratch the surface on understanding the potential of technology and its relationship to contemporary art. With the assimilation of machine to technology, cultural transformations take place. The evolution of electronic culture is a change in the dynamics of society, representation and experience. Kent Anderson Butler - performance/video installation "Immersion" is an investigation of the union between two people and represents the process of ritual and spiritual experience. 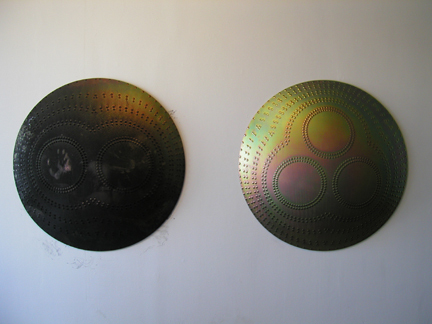 Casey Hanrahan Using materials such as aluminum, steel, and rivets, the artist employs systems of mathematics and design to construct optical meditative drawings for the purpose of targets. 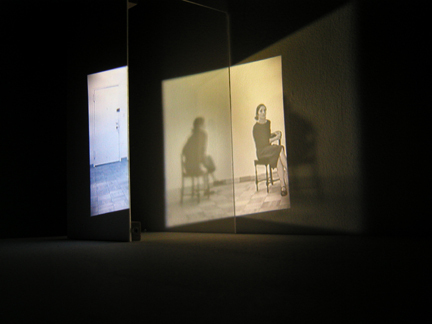 Kristine Marx  video installation depicts situations that are both intimate and impersonal. The banal is experienced as a spatially disorienting and isolating event. The work draws attention to the elastic, permeable boundary between self and other, interior and exterior, reality and illusion. 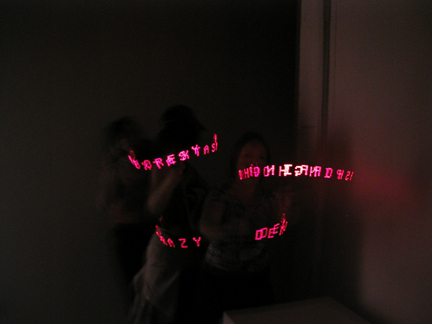 Yucef Merhi  Poetic Words is a work constituted by 4 light emitting spinning devices. When people interact with these machines they will see a word, created by combining two words, related to a social, philosophical or political issue, like Anorecstasy (Anorexia - Ecstasy). In Artistotelian terms, the words always exist in potency but become poetry in motion when the spectators spin the object and feel/interpret the content. 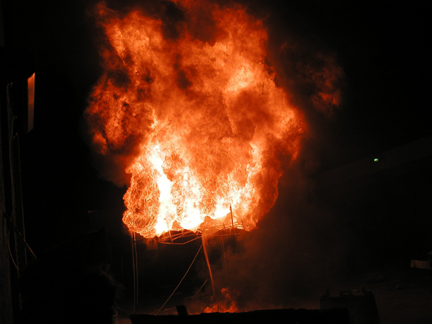 Most recent net-poetry project of Merhi can be experienced at http://www.turbulence.org/Works/yucef. Erwin Redl - elevator shaft light installation. In this body of work, space is experienced as a second skin, our social skin, which is transformed through artistic intervention. Due to the very nature of its architectural dimension, participating by simply being "present" is an integral part of the installation. Visual perception has to work in conjunction with corporeal motion, and the passage of time, an additional parameter of motion. 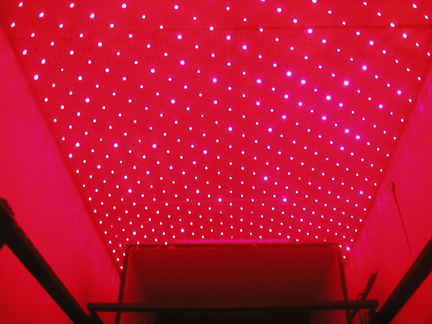 Redls light installation was recently featured at the 2002 Whitney Biennial. 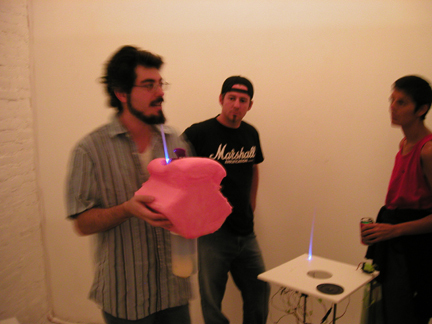 James Rouvelle  interactive sound robotics. Robots are sensitive to changes in light and sound. A blue LED at the tip of each responds to its environment by either illuminating, holding, or dimming at various speeds. Each robot attempts to locate others by emitting, sensing, and responding to a sound similar to sonar. Movement by visitors in the space creates an additional dimension of interactivity. Susan Joyce is an independent curator, primarily focusing on art, technology, and electronic culture. During the past four years, she produced sixteen professional exhibitions for museums, galleries and universities in the United States. She is currently working on Survival Research Laboratories' 2002 shows in New York and Los Angles, also the SRL retrospective 2003-4. 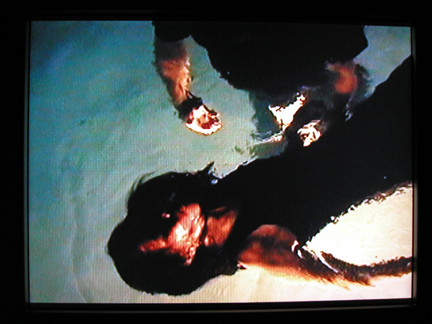 In 2001, she organized Art and Technology symposium and exhibition at Connecticut College, Out of Context exhibit featuring new media work by Kent Butler, Eduardo Kac, Yucef Merhi, Mark Pauline, including live performance events and publication of exhibition catalog at Robert V. Fullerton Art Museum, California State University San Bernardino. She commissioned artworks by 100 artists for Cross-Pollination, a traveling exhibition in New York and Los Angeles. She was selected as one of three international curators by Three Dot Org to participate in Variable Media Project, San Francisco. She also established Fringe Exhibitions 1999.